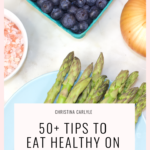 I know a lot of people I work with want tips for eating healthy on a budget. They’re hesitant to buy healthy, organic food because it’s more expensive. Organic foods are the best for your health, wellbeing, and metabolism. But, in spite of all of the benefits of going organic, a lot of people resist due to sticker shock. 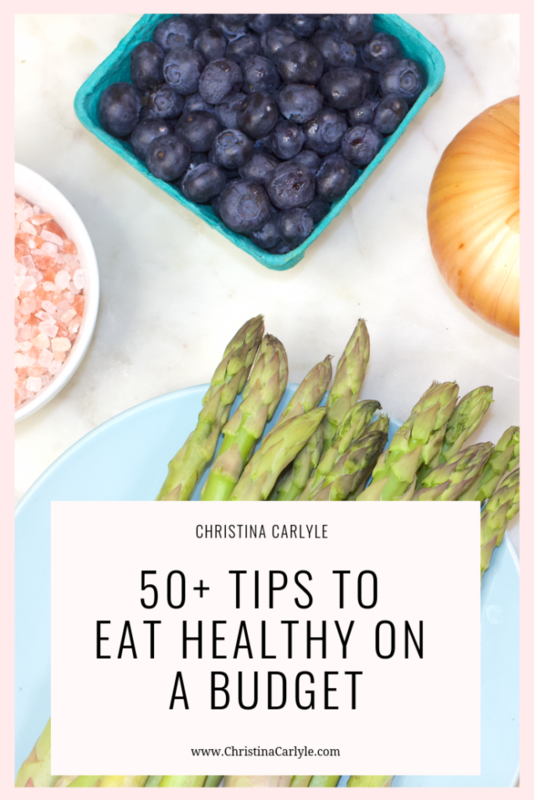 That’s why I put together this post with advice and 50+ tips to save big buying healthy, organic foods. First, I’ll explain why organic food is priced higher and why it’s worth the investment(!). 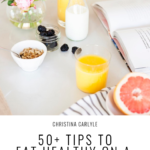 Then I’ll share 50+ of my best money saving tips for for eating healthy on a budget. Why Does Healthy, Organic Food Cost more? It’s true, organic products are more expensive. But, that’s only because organic foods take longer to grow and may experience loss due to pests, fungus, mold, rot… or a bad crop in general. Time = money… and when you can grow more food, faster and avoid losing crop you can make more money. Non-organic foods are less expensive because they use chemicals to cheat Mother Nature and try to turn higher profits. But chemicals are terrible for your body. Your body was never meant to metabolize or digest these toxic chemicals and additives. They can make you sick, inflamed, acidic, and unhealthy. Chemical-laden, cancer-causing growth hormones, immunity destroying antibiotics and dangerous pesticides are commonly found in meat and dairy products. They have been shown to affect immunity and normal endocrine (hormone) function. Pesticides are used on non-organic fruits, vegetables, and grains, (like wheat, soy, and corn). Pesticides, like Round-Up, have been linked to cancer. Foods that are genetically modified to resist pesticide or grow bigger and faster, can affect your health, too. Pesticides and GMO’s – by nature – are poisons, designed to alter and/or kill living things. In humans, pesticides can cause neurological problems, cancer, infertility, nausea, vomiting, diarrhea, allergies and asthma, wheezing, rashes and other skin problems, ADHD, birth defects and more. TIP: The best way to truly healthy foods is eat organic, non-GMO food options. NOTE: Going organic now can save you money in the long-run. You can help prevent unnecessary (and expensive) doctor and pharmacy bills, that can happen from eating toxic foods are a lot more expensive in the long run… costing you time, health, happiness, and wallet. Buying nutritious, quality organic food will save you BIG BUCKS down the road in medical costs, prescription drugs and doctor visits. The choice is yours… pay a premium to the organic farmer now, or the doctors later. The (minimal) additional up-front expense is the only negative associated with living an organic lifestyle. Think of buying organics like an investment in your health. Although cheaper, can you really afford to risk you and your family’s health eating toxic chemicals? When given the choice, can you logically justify buying foods with poisons sprayed on them? 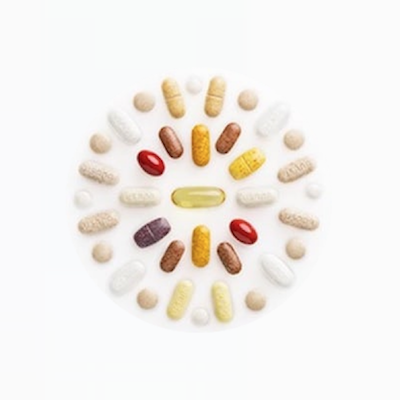 Would you rather have unexpected, unwanted medical/prescription costs? Don’t worry about your bank account, babe! I’ve got your back! It’s completely possible to save money on healthy, organic food options.. and possibly spend less than you currently are. 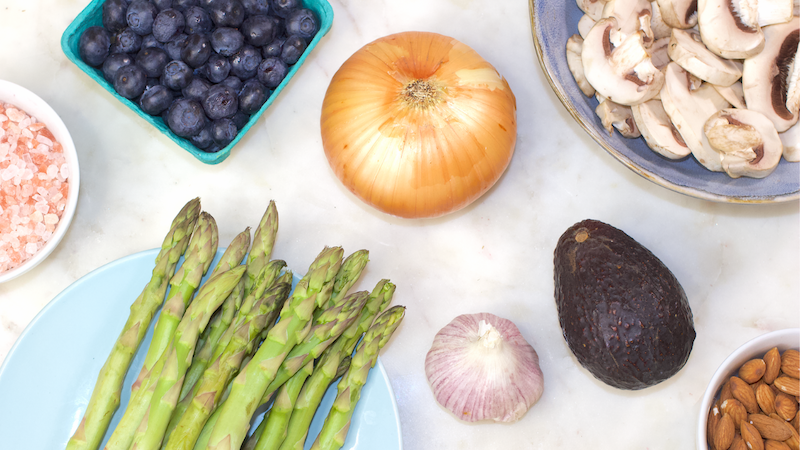 Use these tips to eat healthy on a budget and save big on your grocery bill buying organics. HINT: These are the exact same money-saving tips I share with my clients. Check the websites of your favorite companies for coupons and special promotions, almost all of them have some type of coupon or promotion going on 24/7. Follow your favorite Organic & Health Brands on social media. Sign up for their emails on their websites, too. Company’s often times use social media and emails to share promotions, coupons and deals. Use coupons you find online at your local grocery store. Most major supermarkets will honor coupons for other retailers, so don’t be afraid to use them at your local store. Whole Foods posts new coupons for different organic products every week. Simply Organic (organic spices, seasoning mixes and baking mixes) always have coupons on their website here. DIY Vs. Buy. You can save money easily, making your own organic granola bars, veggie chips, smoothies, and juices etc. instead of buying store-bought products at a premium. Plus, cooking at home is a great way to get your kids involved. Master Portion Control – Portioning out organic meats and vegetables is a great way to save money (and calories)! 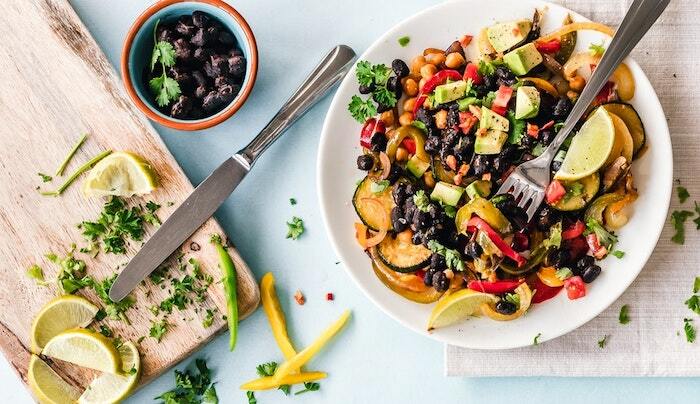 Once you buy organic products, divide then package your pre-portioned foods at the right serving sizes to automatically control over-eating and spending. Stay organized. Fail to plan. Plan to fail… Plan out your meals for the week according to organic foods that are on sale and/or that you have coupons for. 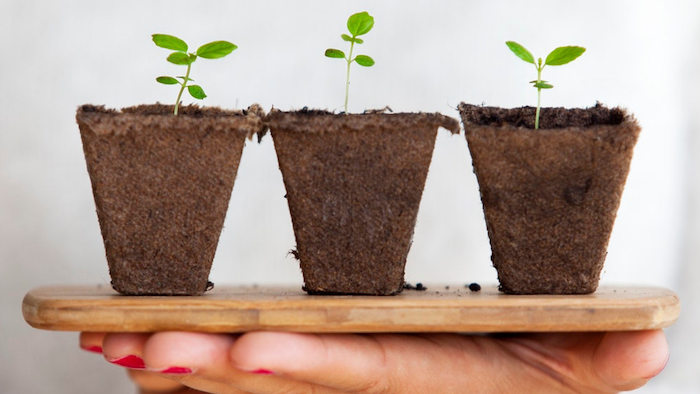 Create an Allowance for Organic Spending – Having a weekly (or monthly) budget can help you track your spending. 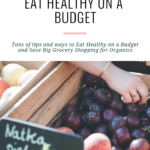 A budget will help you become aware of how much you’re really spending a week and see where you can allocate money towards organic purchases. Meat & dairy (animals products like chicken, eggs, cheese, butter, yogurt, milk, etc.) 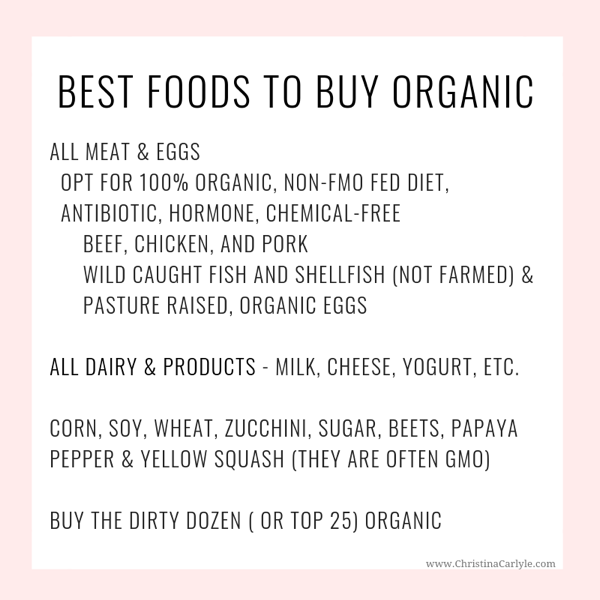 are the most important to buy organic because of the combined risk of pesticide, anti-biotic and cancer causing growth hormone exposure. Whatever you do, do not skimp here. Reduce meat and dairy consumption if you cannot afford organic – One way to do this is to avoid meat before 3pm. For example, you can enjoy smoothies, hummus, juices and salads with lentils and save your servings of high quality meat after 3pm. Buy a whole organic chicken for less per pound, vs. just the breast, legs or wings, which are more expensive per pound. Bonus! You can use the carcass to make your own chicken stock. Avoid buying pre-washed, prepped, ready-to-eat fruits and veggies, as they can cost twice as much if you were to buy and prep them yourself. The EWG ranks foods with the least and most pesticides and they’re called the Clean 15 and Dirty Dozen. You can buy the “Clean 15” inorganic and the “Dirty Dozen” organic. 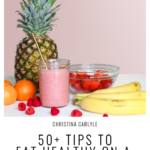 Become a VIP to get a Free Download of these lists – plus a bonus list of the “Top 25” – an extension of the EWG’s Dirty List extended up to the Top 25 foods to buy organic.. Frozen produce is typically cheaper than fresh foods, especially if the fruit or vegetable is out of season. Opting for frozen organic foods instead of fresh can save you money. Prepackaging, then freezing portion-controlled servings will help you have food ready-to-go in the appropriate portion size, that can help save you calories, too. 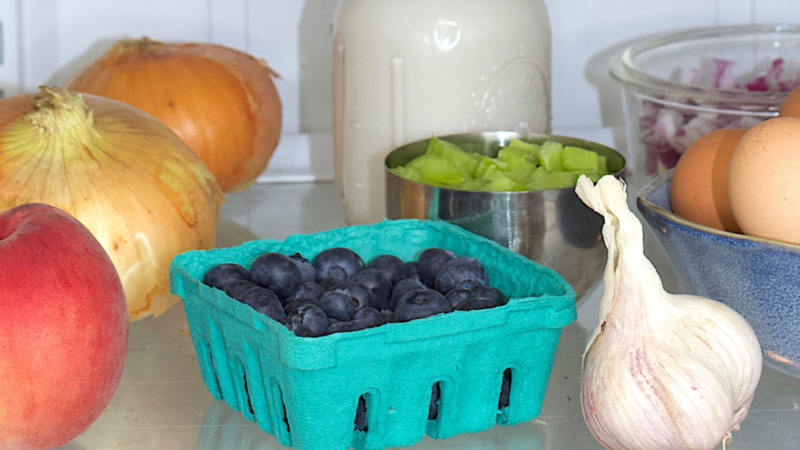 Buy local produce when in season then freeze it, so you have things on-hand during the off-season. For example, freeze fruit like strawberries you get during the summer, so you can enjoy it in the fall. When cooking, double recipes and freeze leftovers, this works great with soups and stews. Freeze all left overs using inexpensive glass jars or BPA free plastic containers. 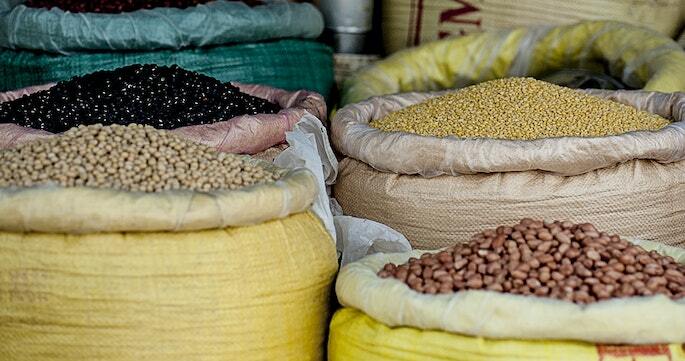 Find out what foods are in season and buy those in bulk, as they are significantly cheaper. Take advantage of the ‘buy one get one free’ sales or buy one get the other for a discounted price. This tips works best, when buying staples. Buy loose, unpackaged foods from bulk dispensers – I personally save a ton of cash by doing this. I buy everything from organic popcorn, nuts, dried fruit and beans. Bring measuring cups with you to the grocery store if you are buying from bulk containers. This way you’ll get the exact the amount you need (for a specific recipe) and won’t pay extra for overages that will go unused. Buy the smallest-sized organic packets or jars of spices. Spices lose their medicinal and health properties as they age. Always opt for the smallest sizes when buying spices and dried herbs and you can save a ton of money while ensuring you’re getting the most potency. Choose less expensive store-brand organic products. Grocery stores like Kroger, Publix and Trader Joe’s, all have organic store-brand options. All organic products are required to follow the same guidelines set forth by the USDA organic certification program. As long as a product has the USDA organic seal, the less-expensive store-brand products are just as good at the name brand. Sign up for your Grocery Store’s rewards Card program. Most convenient stores, grocery stores, and drug stores allow you to sign-up for a rewards or savings card that will help you save money on a few of your items at the checkout counter. For example, if you join Kroger’s Savings Club program, you get points for every dollar spent. Accumulated points can be used towards discounts in the future. 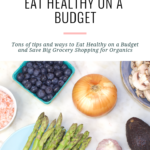 Even if this time of purchase does not contain organic food, the extra money that you are saving on your items can be put towards buying it when need be. Always remember that your satisfaction comes first! If you are not satisfied with your organic product, most grocery stores and organic food companies offer you money back guarantee. If you aren’t 100% happy with your organic purchases you can get your money back. Hit up a local farmer’s market. 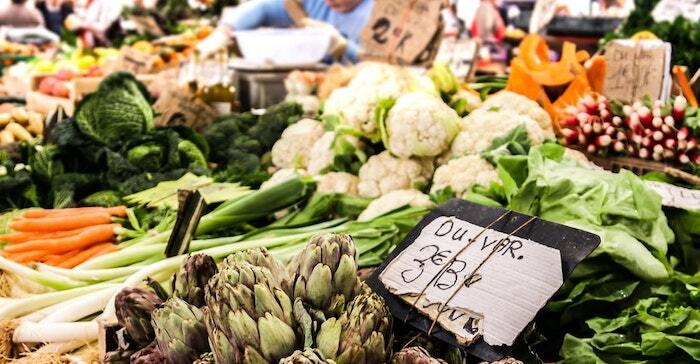 Local food can be significantly cheaper than food shipped from miles away. Ask your farmer about his farming practices. Some farmers do not spray pesticides on their crops but do not seek USDA certification to keep prices lower. Hit up a grocery store instead pricey restaurants. 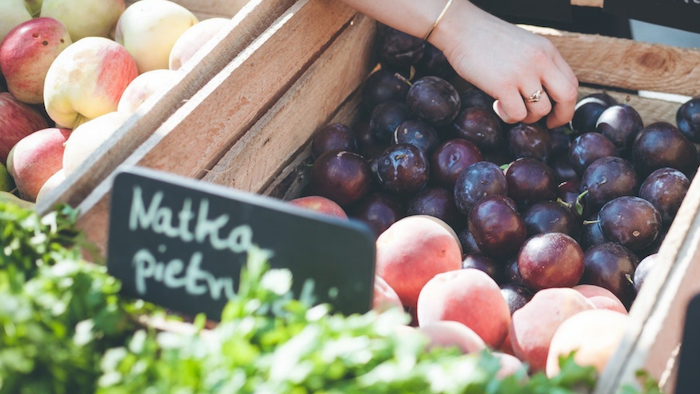 Picking up organic foods at a grocery store will save you money and keep your immunity in-tact while you’re traveling. Bring organic tea with you and ask for hot water. A cup of tea can cost up to $5 dollars, vs. $1 dollar you would tip your server for a cup of hot water. Plus, tipping $1 on a ‘free’ item makes you look like a high-roller. Bring filtered bottled water with you wherever you go. Did you know bottled water, costs more than gasoline per gallon. Use a BPA-free or glass reusable water bottle so you never have to buy expensive bottled water again. At the movies, bring your own organic popcorn and snacks… and smuggle them into the theater in your purse. There is no reason to pay a premium for high-calorie, overly processed junk foods that can make you sick. Keep your organic citrus fruits in the fridge – they will last up to 1-2 weeks longer. Turn almond butter, yogurt, sour cream, tahini and cottage cheese containers upside down when stored in the fridge – this creates a vacuum seal, keeping them fresh longer. Avoid washing organic dark leafy greens or berries until they are ready to consume. If you know you will not have a chance to eat something, freeze it before it goes bad. Did these tips help you? Let me know in the comments. 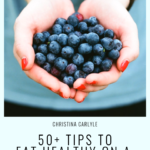 If you know someone who’s struggling to buy organic because of cost, or think this post will help someone who wants to be healthy and keep a little extra cash in their pocket (like most of us! ), please share this post with them. Thanks for spreading the word – let’s make buying organic easier for everyone! Awesome! Awesome! Awesome! I’ve been sleeping on more FANTASTIC Info yet again….brilliant….just brilliant..